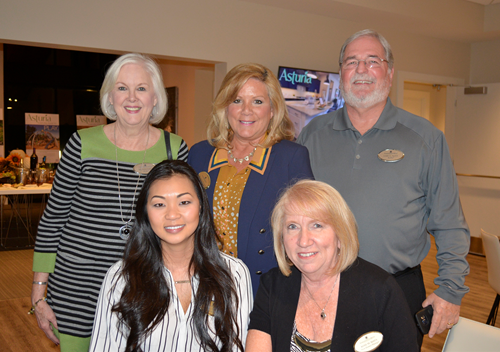 (Odessa, Florida) Thursday, November 16, 2017 Realtors enjoyed discussing sales and the abundant amenities offered at Asturia during an exclusive wine and cheese social in Odessa, Florida. The event was held in Asturia’s beautifully designed clubhouse with delicious food provided by The Stuffed Mushroom and delightful background music by Josh Hobbard. Sean Manson, construction manager and Carla Luigs, marketing specialist, both of Hines, were on hand to answer questions and provide information about Asturia. Eco-Conscious Asturia is a signature mixed-use community featuring a state-of-the-art amenity center with over 5,800 square feet of space including a resort-style luxurious swimming pool, modern fitness center, covered outdoor living rooms and expansive lawn areas for recreation. Asturia offers multi-use paths, green spaces and parks with the newest in playground equipment. Asturia residents have a wealth of daily activities from which to choose and the community is small enough to know your neighbors. Asturia has three premiere builders on their single-family homesites, David Weekley Homes, Ashton Woods Homes and now ICI Homes in the recently opened phase 2 estate lots nestled beside nature preserves. These award-winning builders offer a variety of models to suit any lifestyle. Asturia has multifamily homes called Integra and new townhomes will be offered soon. Retail, commercial, and office parcels are available in the front. Visit Asturia next month on Saturday, December 16 from 2pm to 4pm for their holiday party which will include a miniature, bubble-blowing candy-cane train for children to ride, Santa Clause and his elves, face painting, a bouncy house, a surprise holiday character and other seasonal festivities. It will be fun for the whole family and a chance to see Asturia up close. The beautifully decorated model homes will be open for tours. Hines is a privately owned global real estate investment firm founded in 1957 with a presence in 189 cities in 20 countries. Hines has approximately $96.5 billion of assets under management, including $48.5 billion for which Hines provides fiduciary investment management services, and $48 billion for which Hines provides third-party property-level services. The firm has 114 developments currently underway around the world. Historically, Hines has developed, redeveloped or acquired 1,206 properties, totaling over 390 million square feet. The firm’s current property and asset management portfolio includes 533 properties, representing over 213 million square feet. Visit www.hines.com for more information.